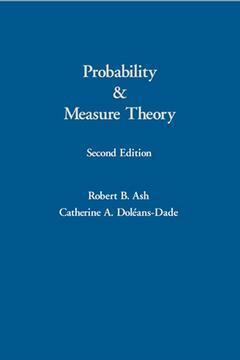 Probability and Measure Theory Ash Robert B., Doleans-Dade Catherine A. Authors: Ash Robert B., Doleans-Dade Catherine A. Add to cart the livre of Ash Robert B., Doleans-Dade Catherine A.
Probability and Measure Theory, Second Edition, is a text for a graduate-level course in probability that includes essential background topics in analysis. It provides extensive coverage of conditional probability and expectation, strong laws of large numbers, martingale theory, the central limit theorem, ergodic theory, and Brownian motion. Graduate students, faculty, and other professionals in mathematics, statistics, engineering, and economics; graduate students and professionals in physics and computer science. Robert B. Ash as written about, taught, or studied virtually every area of mathematics. His books include Information Theory, Topics in Stochastic Processes, The Calculus Tutoring Book, Introduction to Discrete Mathematics, and A Primer of Mathematics.